A research study conducted in 67 countries interviewed parents from diverse cultures, faiths and income levels about what they most wished for their children. The number one answer, by a long shot, was happiness. Every parent wants his or her child to be happy. If you are a parent, you know how true this is. As the name suggests, we see our children as precious, that’s how we want to raise them, treat them and dress them. Precious Cargo’s- Silk Touch Toddler Polo is the perfect attire for your child to experience true happiness in. Precious Cargo’s- Silk Touch Toddler Polo carries a classic style which is popular all year round. It’s a wonderful item for any young boy or girl to make them look smart and trendy while being comfortable and happy. The Polo is most suitable for schools or kindergartens who want to make their children easily identifiable while representing the organization in an honourable manner. It is also perfect for any summer camps or sports teams. It is easily customisable with your brand logo. This polo comes in five different colours; Black, Navy, Red, Royal and White. With these five colors you will have no problem easily matching shorts, pants, skirts or dresses. Creating an overall look which is not only stylish but also comfortable for the toddler in question. Kids don’t like being uncomfortable in their clothes any more than adults do, so make the right choice with the Precious Cargo Silk Touch Toddler Polo and ensure your toddlers are in the best hands possible. This pint-sized version of our grown-up shrink and wrinkle resistant style weighs 5 ounces and is a 65/35 mixture poly/cotton pique. The double-needle stitching in this polo offers increased durability for a longer lasting, hard-wearing polo. 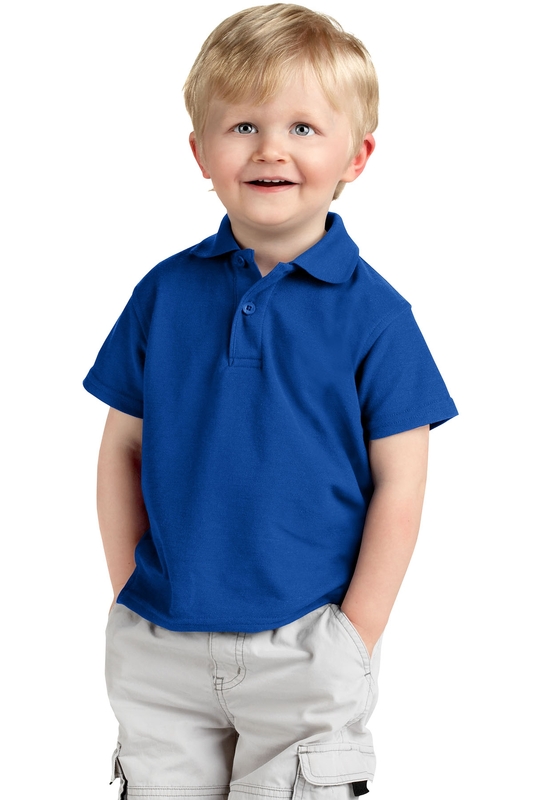 The Precious Cargo Silk Touch Toddler Polo also features a flat knit collar, 2-button placket with dyed-to-match buttons and set-in sleeves to which make this polo a practical choice. There are three toddler sizes available: 2T, 3T, 4T. no matter what toddlers get up to, the Precious Cargo Silk Touch Toddler Polo will have them looking their best. Built for durability, functionality and comfort means that whether toddlers are attending a function, going to kintergarden or just roughhousing in the playground or sports field, this polo will have them covered.